Play The European Though only opened in 1987, The European quickly gained a reputation as one of best links in Ireland, featuring on many top 100 courses of the world’s lists. Check into The Iveagh Garden 4 Star Hotel, Dublin for a three night stay. Play Portmarnock. 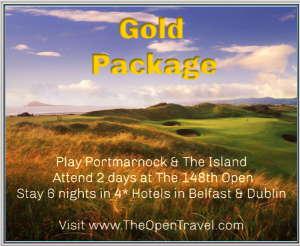 Founded in 1894, one of Ireland’s most revered courses and a highlight on any golf tour, host venue for The 2019 Amateur Championship. Play The Island. Majestic links in rugged sand dunes The Island co hosts The 2019 Amateur Championship and previously has been a qualifying venue for The Open.